I can't be the only person that really struggles when it comes to purchasing gifts? What if the person already owns it? What if they hate it? What if I spend too much? What if I spend to little? Ugh all thoughts that run amok in my brain come each and every birthday and special occasion, if that sounds familar then you may want to check out the three unique gift packages that Velvet Living London have to offer from a little TLC, a bride to be and even an expectant new mother. 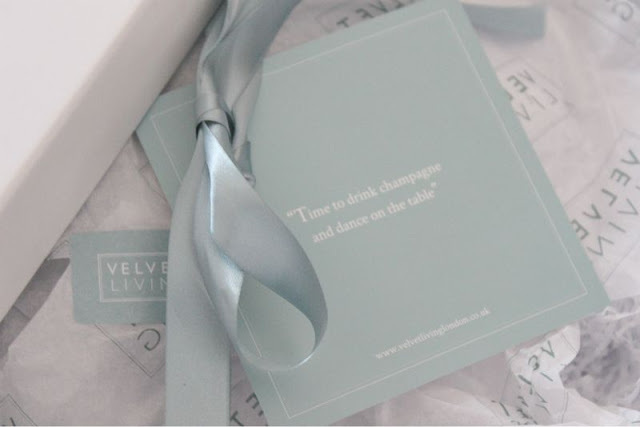 Velvet Living London aim to be an indulgent lifestyle brand pampering to your every need all in the comfort of your home. 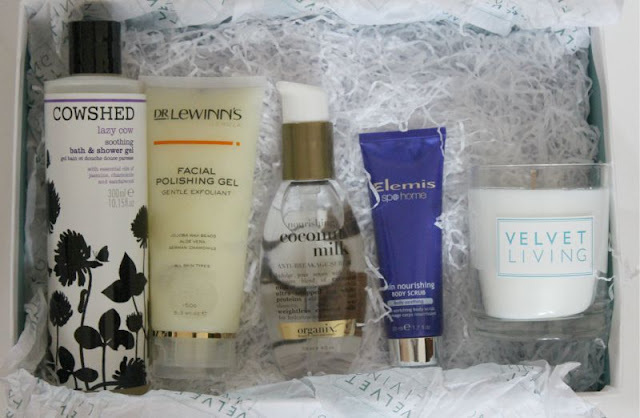 I was kindly sent the Tender Loving Care box to try at home and it quite literally is a spa in a box. So far I have tested out four of the products and have to say that the Lazy Cow Shower Gel is nothing short of fantastic and perfect for a pre-bed shower/bath. I rather enjoy the scent of both the candle and the hair serum and the Elemis Body Scrub was fantastic for buffing off old self tanner. I will of course follow up with full reviews once I have fully tested the contents but I have to say I am impressed and would be a happy chappy if this was ever gifted to me in a traditonal sense (not a PR sample etc). Hopefully Velvet Living London can help you with any gift woes! Looks like a very well put together box, all the items seem to tie together. Can't wait to read the full reviews. They all look like nice products. What a lovely idea to give a little beauty box as a gift to a friend. I will keep that in mind next time I am stuck and don't know what to get for a friend. What a great idea! A great selection of products for a nice pamper. Oh this is a great idea, my mum is one of those people that has everything so may get her something like this for her birthday! This box looks so lovely, seems expensive but those products all look good! This is ok but it's the sort of box anyone could dream up - no really original products there. I really struggle with gifts too! I am terrible with coming up with unique gifts. I really like the look of this I will definitely consider this next time I am trying to think of a gift idea! I love the look of this, a great gift idea!